In mid-November I attended Parks Associates’ annual CONNECTIONS™ Europe conference in Amsterdam. The agenda this year included the technologies, solutions, challenges and opportunities around the connected home, along with a closer look at the emerging smart home market. The attendees included set-top box manufacturers, security companies, smart device manufacturers, and software solution providers. 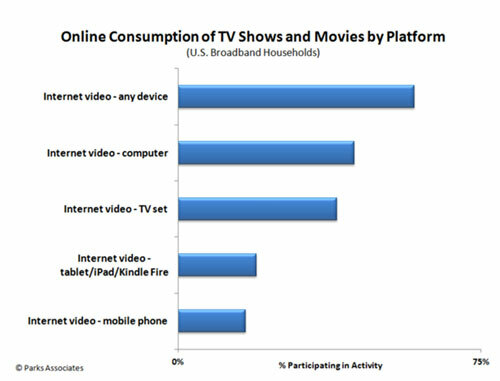 Consumer consumption habits are changing, particularly when it comes to premium content consumption (like TV shows and movies) both in and out of the home. As the Parks Associates graphic below illustrates, consumers today are using a variety of smart devices in their everyday lives, including smartphones, tablets, smart TVs, and computers. I was interested to learn from Parks that adoption of Internet-connected CE has been growing in Western Europe, with 57% of households now owning at least one Internet-connected CE device and 33% of broadband households planning to purchase a smart home device before November 2016. In a report released two weeks ago, Connected Consumer in Europe, the Parks Associates analysts found that consumer purchase intent for additional devices is high across multiple European markets despite ongoing technical challenges and continuing consumer concerns regarding security. This Parks research confirms the importance of industry standards and the need for interoperability to ensure consumers can enjoy a reliable and user-friendly experience when watching their premium content on whatever their preferred device or service, whether they are in or out of their home. In working with my customers (CE manufacturers, service providers, and content owners), while their products and services may be different, they all want to ensure that their consumers can readily enjoy their digital content anytime, anywhere when using their product or service. This focus on standards and device interoperability is squarely in our wheel house and has been a top priority from the beginning when Twonky was first launched in 2004. I found the discussions and the attendees at the Parks CONNECTIONS conference to be stimulating. Like everyone else, I am looking forward to seeing how the connected home and smart home continue to evolve in 2016. Next up on the calendar is the Parks CONNECTIONS Summit held during CES in Las Vegas. Our CEO John Driver will be a panelist for the 1:10 p.m. session on January 6 entitled Cloud-based CE and Virtualization: Converging Video Services. We hope to see many of you there in Las Vegas!